A new study confirms the impact that structural disadvantage and segregation has on life opportunity. 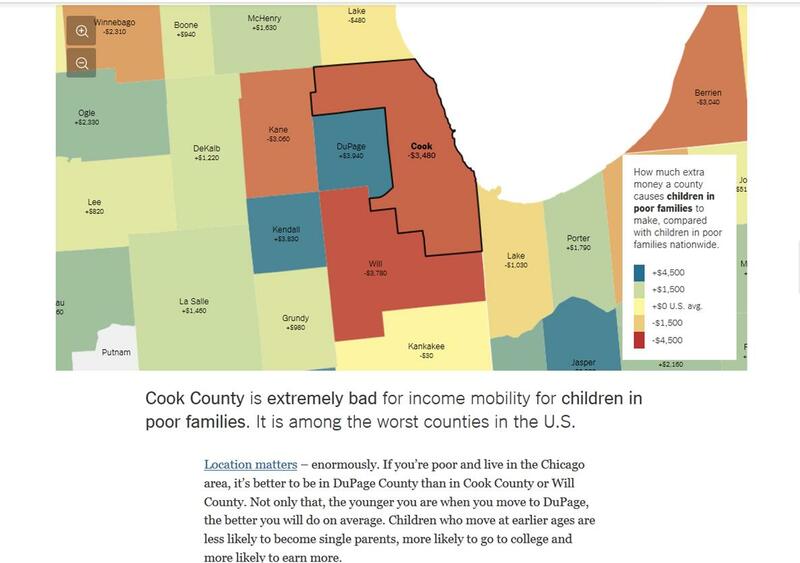 Based off of the long-studied Moving To Opportunity experiment, the results show that for children from low-income households, moving to a better neighborhood before their teenage years improved their likelihood of going to college, and increased their future earnings. Past studies of the MTO had mixed conclusions for the long-term impact on the households, with some studies failing to find any positive impact on education or earnings, and some finding the impact limited to improved mental and physical health. But the newest study found that disentangling the effects for children who moved in their earlier years (below 12), and those who moved in their teenage years, produced distinct results. The results lead to the straightforward conclusion that longer and earlier exposure to better opportunities and neighborhood-based advantages leads to better results. Although the conclusion is straightforward, it’s important to pay attention to how it’s framed by the media outlets that cover this topic. There is low opportunity in ‘bad’ neighborhoods because of intentional, historical and continued segregation, and structural disadvantages that play out across schools, jobs, experiences with the justice system, and all facets of socio-economic life. We should be wary of narratives that promote the “judicious character” of families that move to opportunity, as if those that stay behind are making poor choices, an entire community of ‘poor choosers’. We can’t move or choose our way to good neighborhoods for all, nor to good schools for all- we have to address the structural inequalities head on. Another important side-note about this study, is that it was authored by Raj Chetty, whose previous study was the controversial value-added study of teachers that made the claim that teachers with high value-added increase the lifetime earnings of their students. The study was highly controversial for the dubious value-added methodology, the enormous assumptions required to link it to subsequent lifetime earnings, as well as for the flashy media headlines it generated. But it’s important to draw a stark contrast between the two kinds of studies. The current one is based on an experimental research design backed by decades of confirmed, cross-disciplinary research on structural inequality and neighborhood segregation, and the former one based off of a highly-questionable statistical method that requires ‘heroic assumptions’ to be considered causal.